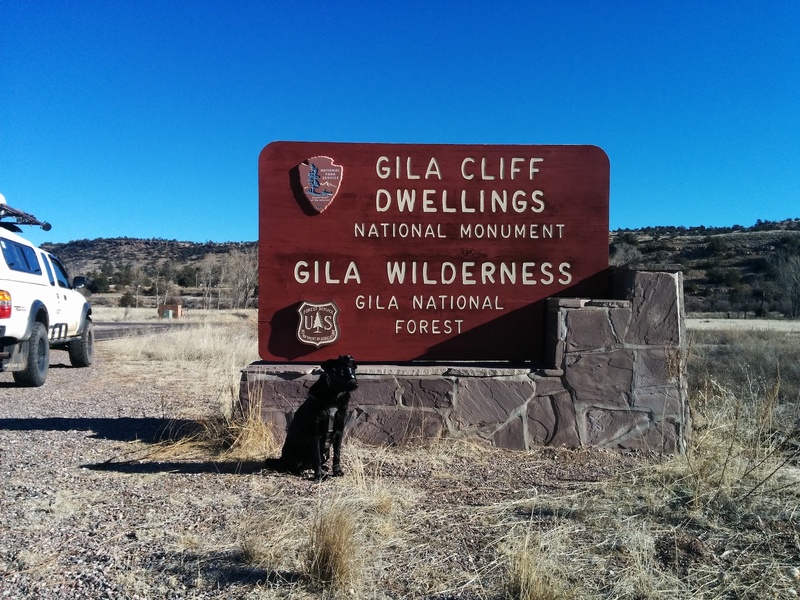 While spending a month adventuring around New Mexico we decided to use more of the Atlas Obscura to help us find interesting and/or weird places to explore. Driving into the state via the lower western edge along Highway 10 the first interesting option that caught our eye was the Cliff Dwellings up north above Silver City. 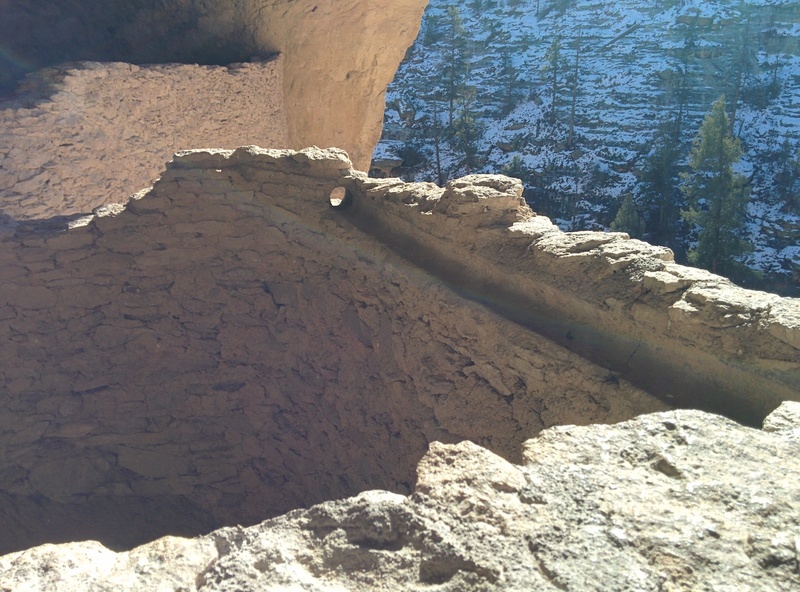 We enjoyed our visit to Walnut Canyon in Flagstaff Arizona and from the pictures we have seen this looked like a much better preserved example of the Mogollon/Mimbres culture. After our late start and slow progress the day before we had decided to not arrive at the Monument late or even after it closed for the day and so spent a somewhat chilly night about an hour away at Bear Canyon Reservoir. Our timing could not have been more fortuitous as the destroyed portion of Highway 15 leading to the Monument had recently been repaired and access to it had been restored only a week before we arrived. The Monument only gets 15,000 visitors or so a year and during this time of the year they are lucky to get a dozen people a day. When we pulled up to the actual Contact Station a little past 9am we were the only visitors there. This is the small Ranger Station where you pay ($5 but our Access pass made it Free), get a little paper handout and are pointed in the right direction. It was easily in the low 40’s and a slight breeze made its chilly presence known. 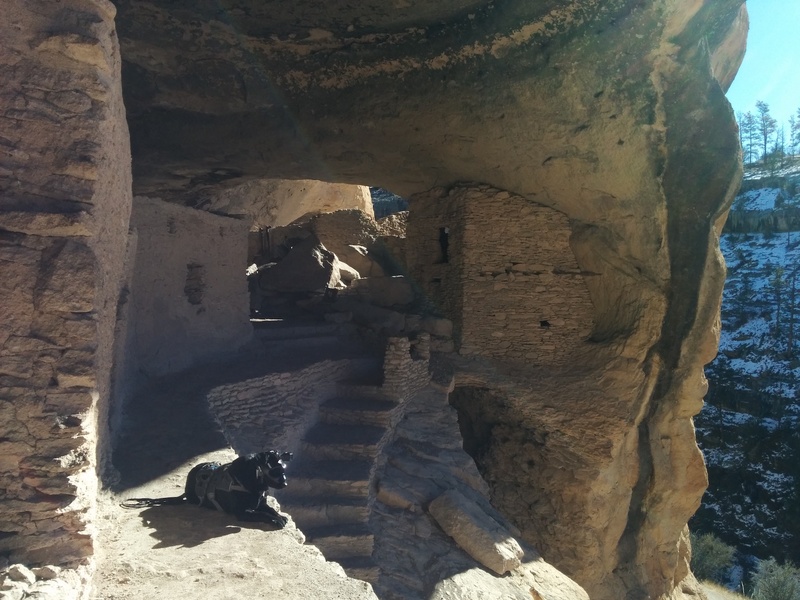 The trail is NOT wheelchair accessible and people not accustomed to the elevation or in less-than-healthy shape would do well to just relax and explore the visitors center and museum a few miles away from the actual Dwellings. 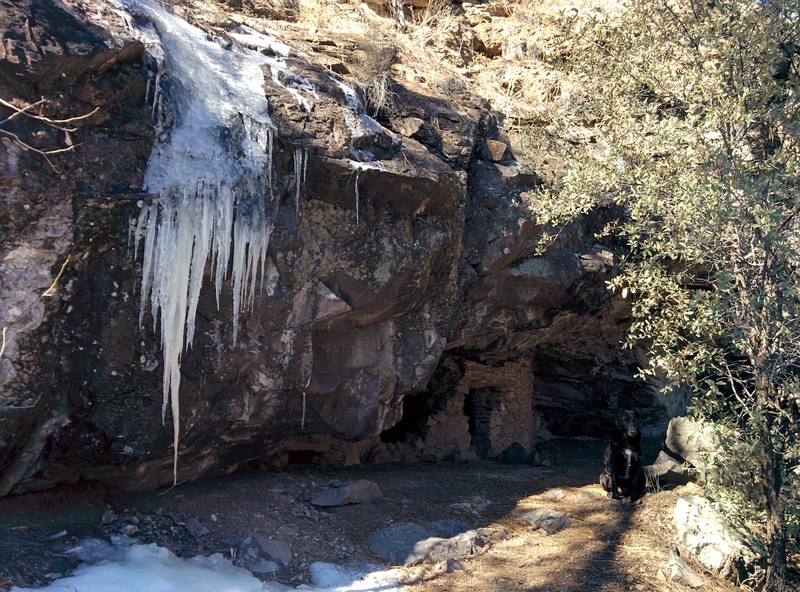 The one mile loop hike started by walking over a bridge still covered with crusty frost that spanned a portion of the Gila River. 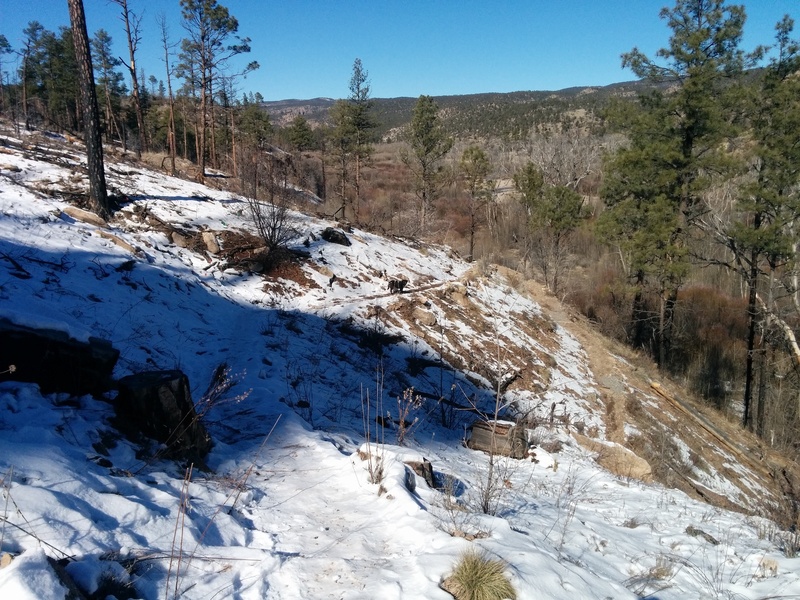 Once across we turned left and up the canyon along a series of icy switchbacks. Some portions were dappled with sunlight while the majority were under shady tree cover and the temperature difference between the two was noticeable. 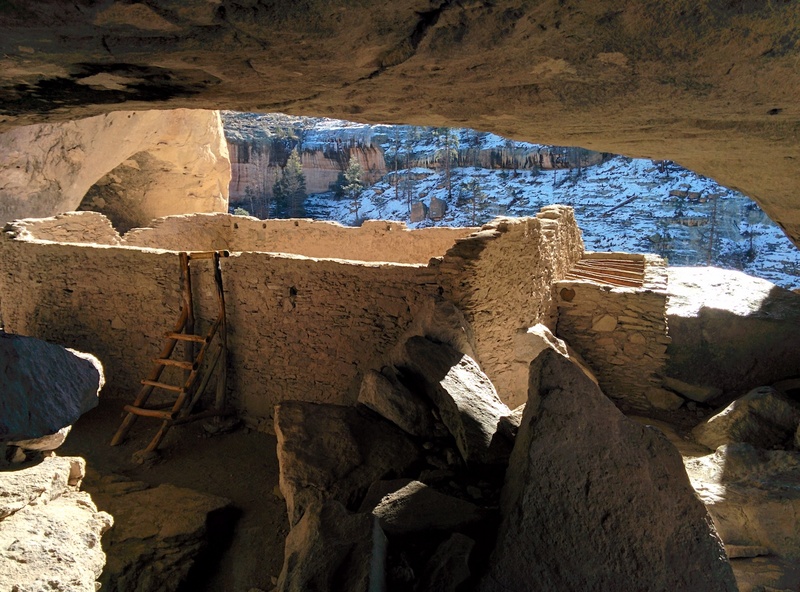 The Rangers on duty switch off among themselves between staying down at the contact station or hiking up to the ruins to give guided tours at the cliff dwellings. Our first clue that these folks knew what they were doing was that someone, that morning, had hiked up to the ruins carrying a heavy container of gravel and had tossed it on the icy sections of the trail as a traction aid. Thank You. At one of the switchbacks we looked back the direction we had come in and saw a glimpse of what awaited us up ahead. The geology of these caves began about 28 million years ago when volcanoes dumped deep deposits of ash which eventually became compressed into Tuff. Over eons as the creek rose and fell and changed course a countless number of times it began to undercut the rock which allowed water to seep into those small openings. Over time the water weakened the rock enough that gravity could take over and small flakes and large chunks fell away, were broken into smaller pieces and washed away and eventually the alcoves were enlarged to the size they are today. At the top we were met by two volunteers who were happy to either give us the detailed tour or just let us wander about on our own unmolested. 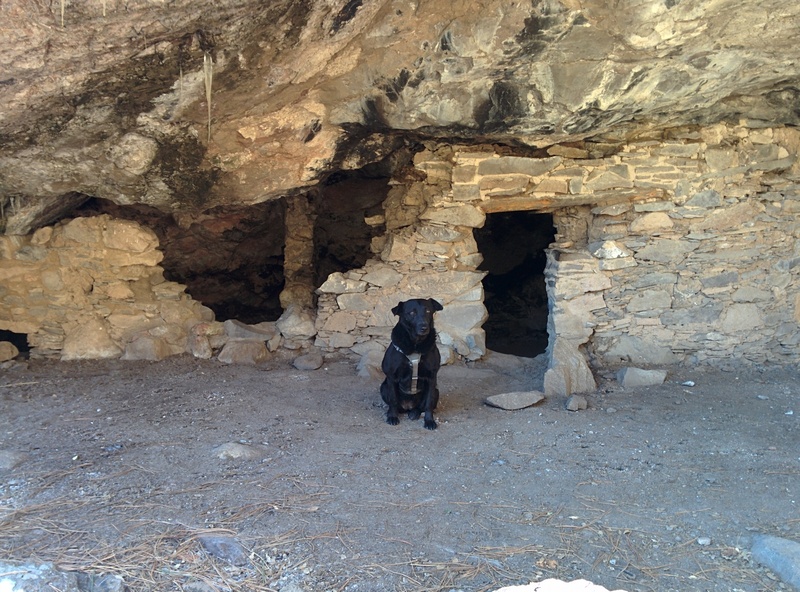 Since I find sites like this fascinating we chose the full dog and pony show and they led us in and out and through and around all the interesting little nooks of this site that once was occupied by 10 to 15 families or 30 to 80 people. The scientific consensus is that these dwellings were occupied only for a short time, perhaps from the 1280’s to the early 1300’s. No one knows exactly why the site was only occupied for those short years before its inhabitants moved on but there was a long drought during that time which could have affected both their crops and the wildlife in the area. It is also known that some Apache showed up on the scene shortly after they left. I think that they had heard word of the Apache’s approach and, since the drought had made the area not as productive as it once had been, decided to get out while the getting was good. In general the Apache were known as a far more aggressive people than the Mogollon or Tularosa Mimbres and so the Cliff Dwelling inhabitants decided to find a new home with their families and belongs intact. That’s my semi-educated guess. There are actually seven caves in this complex although only the first five have evidence of structures built inside. Cave six has soot evidence that fires were built in it while archeologists in 1968 used climbing gear to rappel down to cave seven from above but found no sign of human activity. 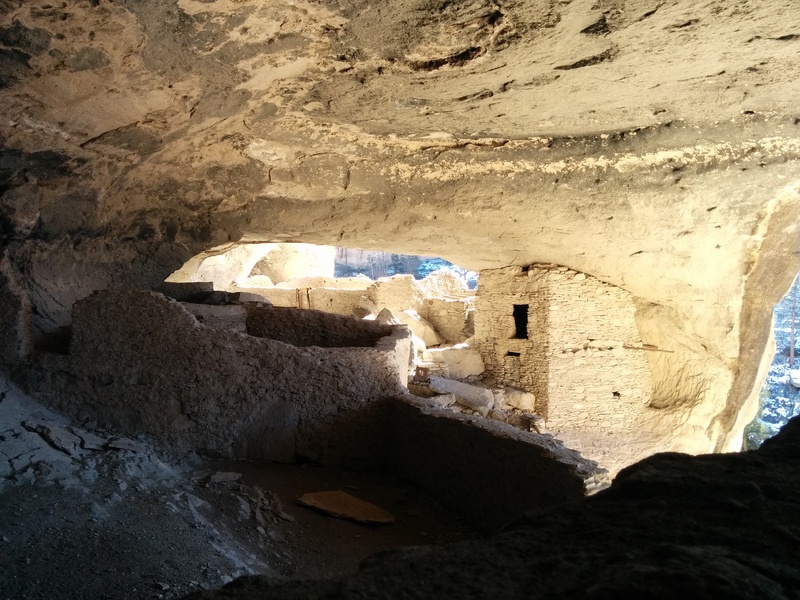 There are about 40 “rooms,” some with actual walls or remnants built inside the five natural caves. 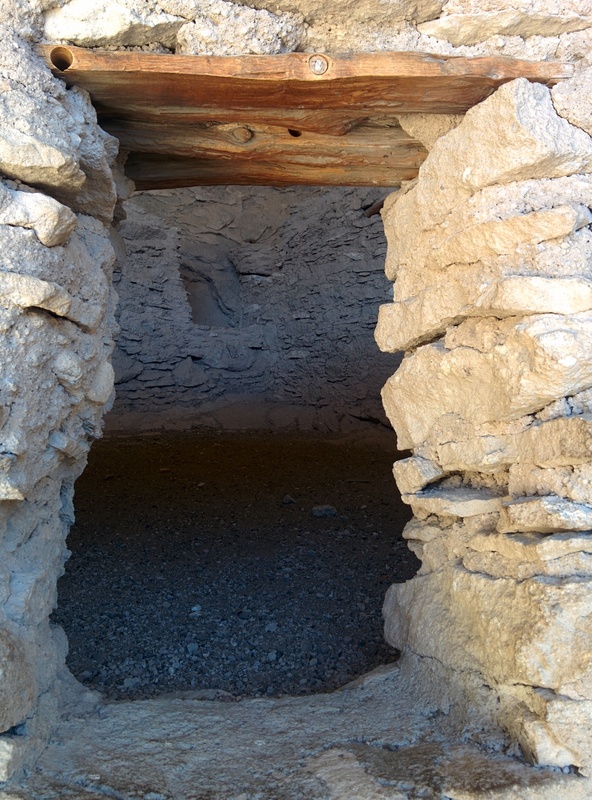 Some were thought to be food storage, others individual family rooms and some more were public, communal spaces. 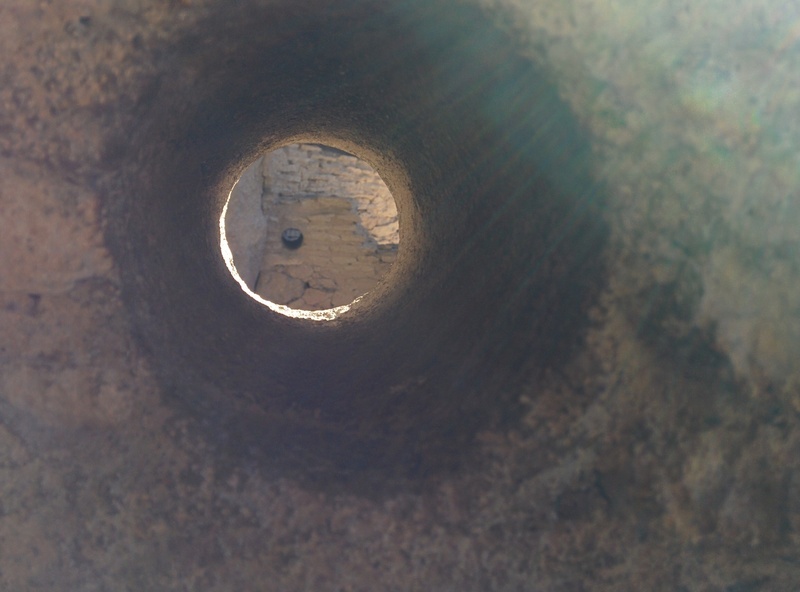 The partial poles and pole holes suggest some of the rooms were two stories. Incredibly, even after all the decades of misuse, vandalism and looting 80 percent of what remains of the architecture is original! Ladders also allowed access into the dwelling for its inhabitants and they could be taken up at night as a protective measure. Dendrochronology (tree ring dating) determined that the wood used in the dwellings were cut between 1276 and 1287 which helps place the time of active habitation. Over the years several mummified bodies and a burial ground have been found on the site. Many were presumably lost to looters before the government took over administration of the site although in 1912 a mummified infant, later referred to as “Zeke,” was located and supposedly turned over to the Smithsonian. We didn’t take pictures of the graffiti that has been carved into wood, stone or masonry but there were more than a few examples. 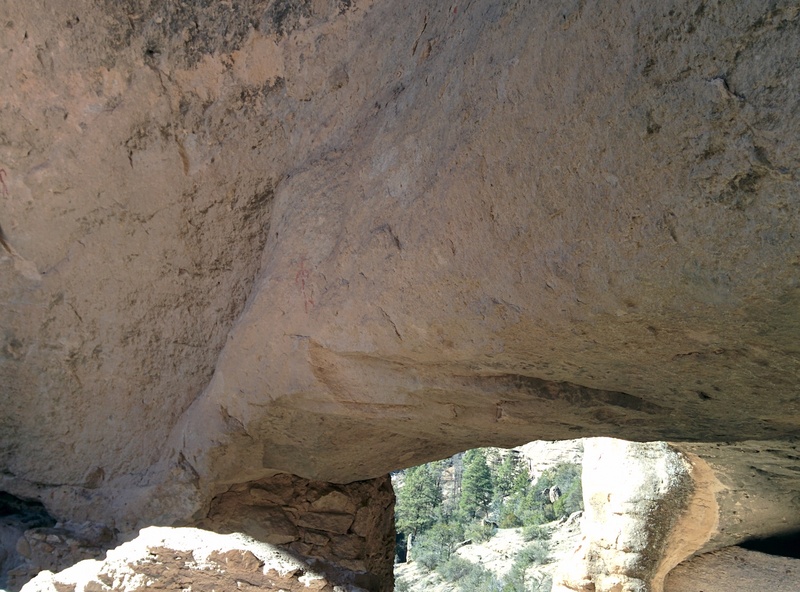 Sadly the fact that far too many idiots seem to think their mere presence deserves commemoration by carving or writing their name for posterity has been a problem at least since some douche named C. Gerrish carved his name and the date June 1, 1889 on a wooden slat in the cliff dwellings. After thanking the two knowledgeable volunteers for their time and insights we started back down towards the Contact Station. 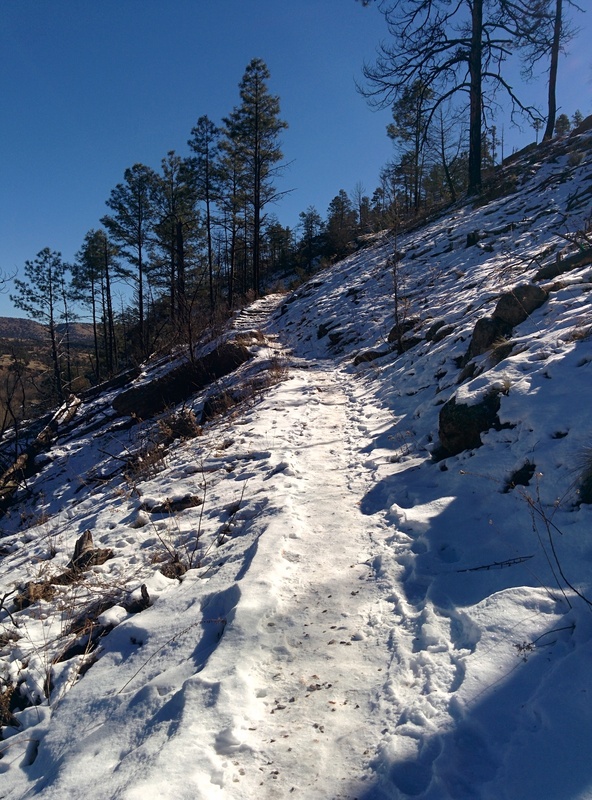 We had been told in advance that the return trail was mostly shaded this time of the year and so more snow and ice-covered than the trail up. Because of that many people choose to take the same way down as they did coming up. 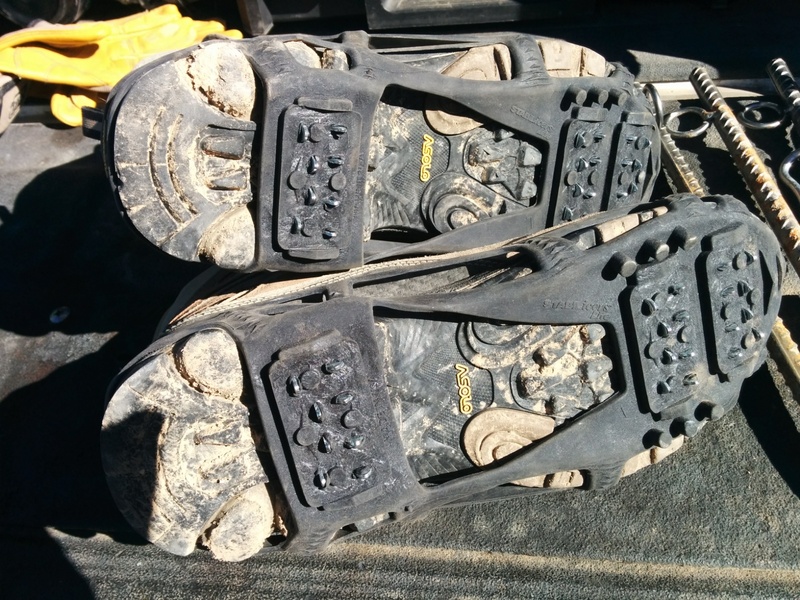 Since Willow has 4-paw drive and I had wisely decided to slip my pair of STABILicers traction devices over my already capable Asolo hiking boots we decided to take the more difficult route. Driving away from the main parking lot we stopped by a few of the campgrounds on the access road. In the Lower Scorpion campground there were signs indicating a cave dwelling was just up a short trail and so we went to take a look. We like the idea of this home almost more than the main group of cave dwellings as it appeals to our sense of “close but not too close.” Near enough to the main group to be a part of the tribe but far enough away that things are not too crowded and you have time away from the crowds. Just the way we like it. For more in-depth insight into the monument and its history while under the protection of the U.S. Government the NPS has published quite the interesting Administrative History online and available to the public. 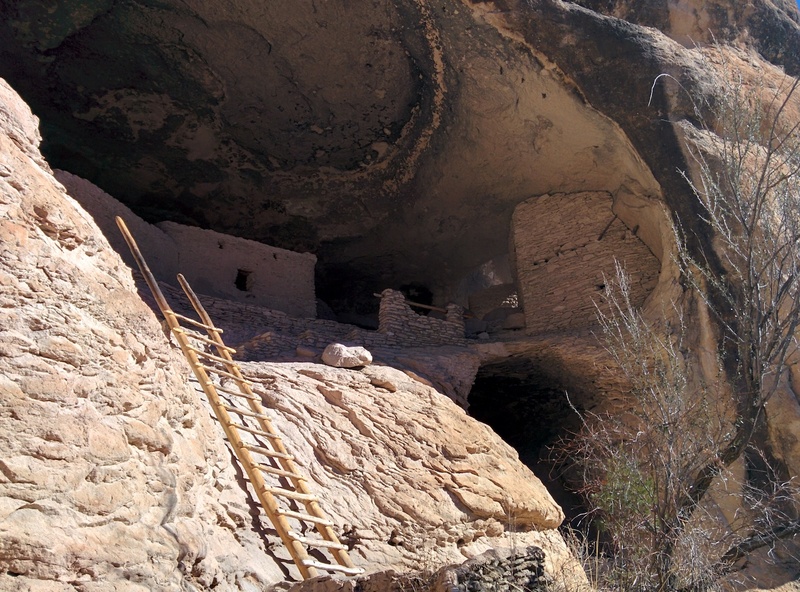 The main NPS website for the Cliff Dwellings is here. 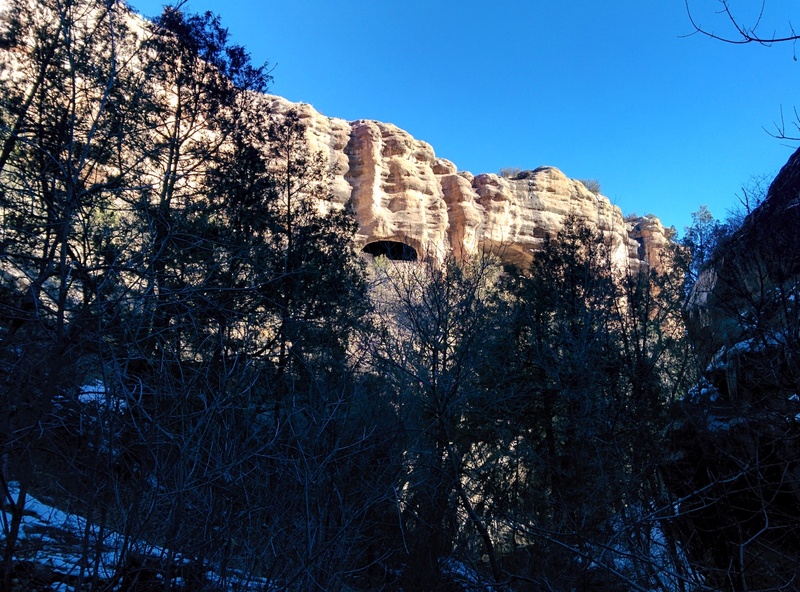 If you find yourself in the area and have an interest in the geology and historic Native American culture of the area this site is a fascinating look into their living situation and the natural forces at work that created the caves in the first place. It is a very inexpensive entrance fee and we highly recommend you make the effort to stop by and take a look.